DataStax, the rising NoSQL database vendor that hawks a commercial version of the open-source Apache Cassandra distributed database, plans to announce on Tuesday that it has acquired graph-database specialist Aurelius, which maintains the open-source graph database Titan. All of Aurelius’s eight-person engineering staff will be joining DataStax, said Martin Van Ryswyk, DataStax’s executive vice president of engineering. This makes for DataStax’s first acquisition since being founded in 2010. The company did not disclose the purchase price, but Van Ryswyk said that a “big chunk” of DataStax’s recent $106 million funding round was used to help finance the purchase. Although DataStax has been making a name for itself amid the NoSQL market, where it competes with companies like MongoDB and Couchbase, it’s apparent that the company is branching out a little bit by purchasing a graph-database shop. Cassandra is a powerful and scalable database used for online or transactional purposes (Netflix and Spotify are users), but it lacks some of the features that make graph databases attractive for some organizations, explained DataStax co-founder and chief customer officer Matt Pfeil. These features include the ability to map out relationships between data points, which is helpful for social networks like Pinterest or [company]Facebook[/company] who use graph architecture to learn about user interests and activities. Financial institutions are also interested in graph databases as a way to detect fraud and malicious behavior in their infrastructure, Pfeil said. As DataStax “started to move up the stack,” the company noticed that its customers were using graph database technology, and DataStax felt it could come up with a product that could give customers what they wanted, said Pfeil. Customers don’t just want one database technology, they want a “multi-dimensional approach” that includes Cassandra, search capabilities, analytics and graph technology, and they are willing to plunk down cash for commercial support, explained Van Ryswyk. 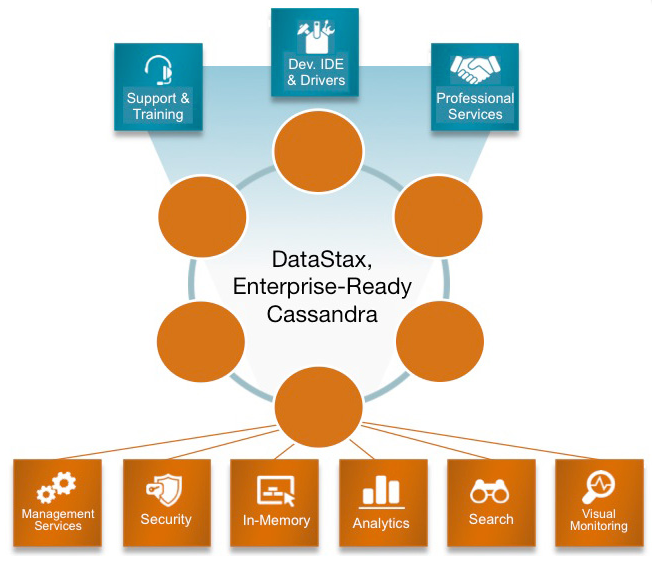 Because some open-source developers were already figuring out ways for both Cassandra and the Titan database to be used together, it made sense that DataStax and the Aurelius team to work together on making the enterprise versions of the technology compatible with each other, Van Ryswyk said. Together, DataStax and the newly acquired Aurelius team will develop a commercial graph product called DataStax Enterprise (DSE) Graph, which they will try to “get it to the level of scalability that people expect of Cassandra,” said Van Ryswyk. As of now, there is no release date as to when the technology will be ready, but Pfeil said work on the new product is already taking place. If you’re interested in learning more about what’s going on with big data in the enterprise and what other innovative companies are doing, you’ll want to check out this year’s Structure Data conference from March 18-19 in New York City.